The history of the 1960s and 1970s seen through the eyes of an innocent. 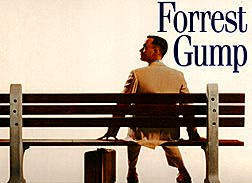 Director Robert Zemickis' "Forrest Gump" is a sweeping epic that never lose sight of the humans in the landscape. The heavy weight cast includes: Tom Hanks, Robin Wright, Sally Field, Gary Sinise, Hanna Hall, Mykelti Williamson, and Michael Humphreys.